While it makes sense to use dedicated desktop apps for pragmatic animation, but if you just want to create a small video or gif animation on your android smartphone or tablet to sketch out ideas, there are many apps developed especially for that purpose. Creating simple and basic 2D animation gifs and videos can be easily done if you have the right app. We did our research and we have one incredible animation maker app with all the features needed. Let’s discuss it. 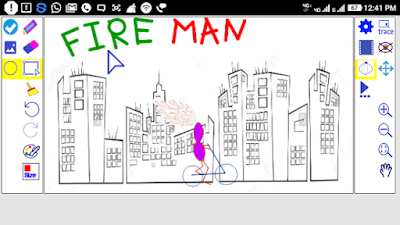 Developed for android users, this animation maker app for its users has to offer all the features they need to easily and effortlessly create basic simple 2D animation gifs and videos from their camera and gallery files, from the web, and search and trace, drawing with using virtual pen or stylus. The app is working better with stylus and the user can use it for many purposes like entertainment, presentations, and more applications by choice. Using the app, the user can easily create unique videos and gifs without a lot of effort. What are the best features of Flipbook Animation Maker? The Flipbook Animation Maker helps the users with the features offered to create 2D animation videos and gifs for many purposes all by their preference. Users by using the app have the chance to use one finger for moving the pencil and two fingers for drawing and erasing. The app also offers users to draw using a finger or stylus or double finger as well. The drawing feature is allowing the user to use pencil and eraser, a color picker and an option to choose the size of the eraser and pencil. Users can insert an image or images, select, rotate, move and flip it, tracing just by selecting from their gallery or camera, moving, rotating and flipping as well. Tracing images is easily done with the app, the user is offered inbuilt feature for rotating, resizing and flipping. The multiple layers and key-frames are available on the app as well and so are the feature for onion view, onion toggle hide and show and layers toggle with hide and show options. Users are offered to use undo and redo features if needed. To create avi video animation and or gif video file, the app is offering frames. For drawing oval, rectangle, round rectangle, diamond, stars, polygon shapes are offered different tools with the fill and stroke options. No need for drawing for each frame, the user can insert a key-frame and make changes for it for that specific layer and position of the frame. 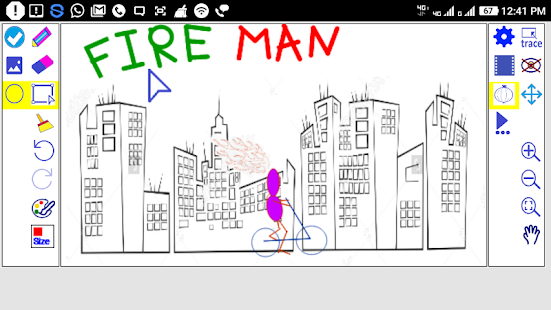 Download the app for free on Google Play now to make basic simple 2D animation gifs and videos!